Living, laughing, loving my busy days and nights. Today I registered Austin for Kindergarten. I wasn't prepared for how that would feel. 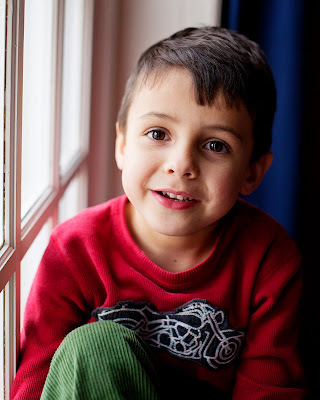 How could he be 5 already? I don't think I am going to be able to hold it together well in August. Time is flying by too quickly! I haven't done an entry in I Heart Faces for over a year, but I just couldn't resist this week's theme which is "Best Face in February". 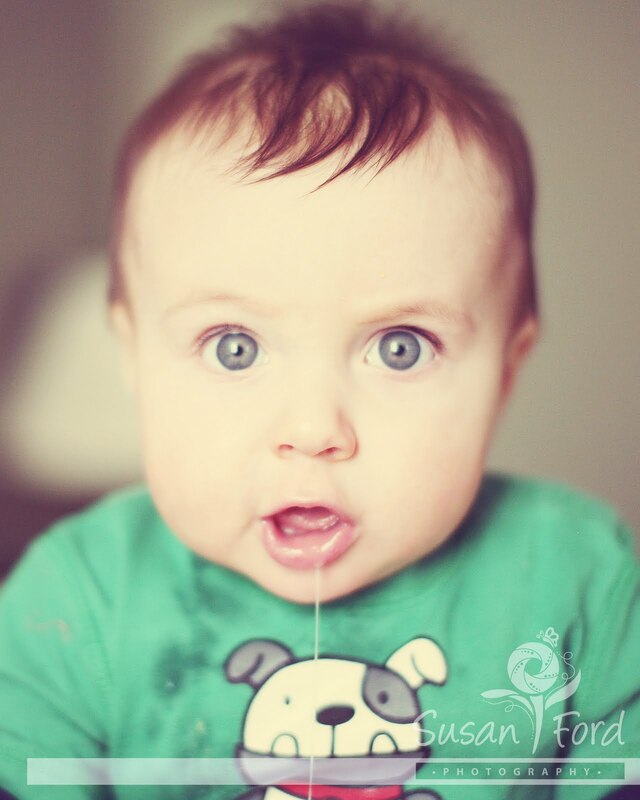 My baby turned six months old last month and one day while taking some pictures of him and his new mastery of sitting up like a big boy, he was full of expression and DROOL! This was easily my favorite image from that day and the whole month. To see more entries in this week's contest go here. 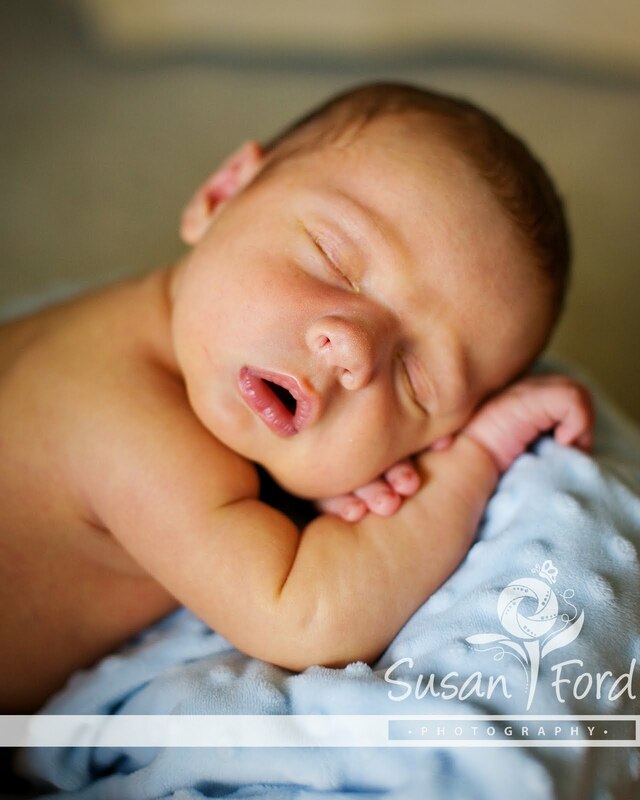 Tomorrow our precious new son will be 3 weeks old. It is truly stunning how fast time goes by. My induction with him went very smoothly. So smoothly in fact that I was able to catch up on a favorite show of mine that happened to be running a marathon that day, read a couple magazines, keep friends and family updated on Facebook and through texting and even snooze a bit here and there (after the epidural of course). I have been blessed with quick deliveries in the past and this one was no different. I progressed from 5 to 10 cm in one hour and had him pushed out completely in about 5 pushes. The cord was wrapped around his neck twice, his shoulders were stuck and he was a BIG boy, but I got him out quickly nonetheless. He came out so fast in fact, that his poor face was pretty badly bruised and he had hematoma in both of his eyes. Needless to say, we won't be showing off a vast array of hospital pictures. So, on July 29th at 4:48pm, weighing 9 pounds and measuring 22 inches, Jaxon Glenn Ford was born. As I mentioned in my previous post, we choose his name not just because we liked the sound of it, but because of its meaning. Over the last year or so we have gone through some really trying times, the greatest of which was Mark getting unfairly pushed out of the company he envisioned, built and greatly sacrificed for. The greatest sting was that it was at the hands of a friend and a family member. Being unemployed in this economy is tough, but many days that didn't compare to the emotional roller coaster that resulted from the broken relationships. We definitely went through a period of questioning why all of this was happening to us, but then God began to make it clear that He would bring beauty from the ashes and He had a good and perfect purpose in Mark's removal from the company. When we found out that we were pregnant with our third child we knew that though the timing would present challenges, this baby would be a tremendous blessing in our lives. He was a bright spot in some really dark days and as we began to talk about names, we decided that we wanted to give him a name that would have significance based on what we were going through. Our focus had changed by then and we were constantly looking for all of the good things that our trials were bringing us. It seems odd to say considering the circumstances, but the blessings have far outweighed the difficulties and as I said, we know beyond a doubt that God is doing amazing and beautiful things in our lives through this. We looked at name meanings for days and never really found anything that had the right combination of meaning and a name we could live with. Finally one night I went back to the list of names we had made when we were pregnant with Mia to see if any of those boy names would work. Jaxon had been high on my list of names I liked and we had chosen to spell it that way because Mark wasn't a fan of the nickname Jack, but did like the nickname Jax. Oddly we had never even looked up what that name meant, until we went back to the list this time. I could hardly believe my eyes when the search results came up. I knew immediately that Jaxon would be his name. It was perfect! Jaxon means, "God has been gracious. He has shown favor." It so encapsulated how we had begun to feel about our circumstances. God was daily revealing a new plan for our lives and though the difficulties were many, we constantly did and do feel blessed to be right where we are. As far as his middle name, we chose the name Glenn after Mark's dad. He is a man of great integrity and honoring him gives us tremendous joy. Jaxon is such a good baby and we are all loving on him on a daily basis. Both Austin and Mia have adjusted better than we even expected. So far there are no signs of jealousy, only love. And boy do we love our little Jaxon!!! Well, considering it has been since November that I have posted something on this neglected blog, it won't come as a surprise that I have been working on a "nine month project." As would be expected, Austin and Mia have grown in leaps and bounds and are very excited to get to meet their baby brother. These pictures were taken this morning on the eve of my induction. That's right...this baby is coming tomorrow! It is the eve of your birth and there are so many people that are very excited to meet you. However, I, your mommy, have a little more of an urgent need. You see, you are my biggest baby and for at least a couple weeks you have been making things much more difficult and uncomfortable for me. It is certainly all worth it to have you in my arms, but I won't be missing your acrobatics, the intense heartburn, the sweating and the hip pain. I have known you were a boy since early on in the pregnancy. As soon as my aversion to coffee flared up, I knew. You see with Mia I could smell and drink coffee fine, but with you and Austin it would send me running. Your abuelita was the same way when she had your grandpa and his brothers. Generally, my pregnancy with you has been good and easy. I believe you have been my most active baby though! It makes me wonder so often what your personality will be like. 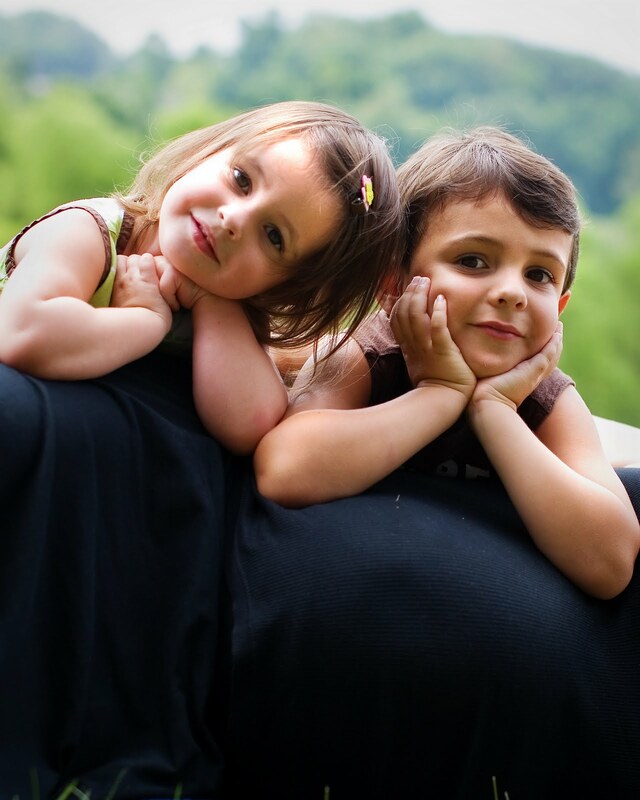 What kinds of things will you have in common with your siblings? me? Daddy? I can't wait to see what you look like! Austin and Mia looked very similar as babies and many people think they still do, but you may just be a completely different mix of Mommy and Daddy. We don't know you yet, but there is one thing we know for sure...you are a blessing! Our family has been through a lot of hardship in the last 10 months, but you will certainly be one of our greatest joys. We have chosen a special name for you and can't wait to share it's meaning with everyone we know. 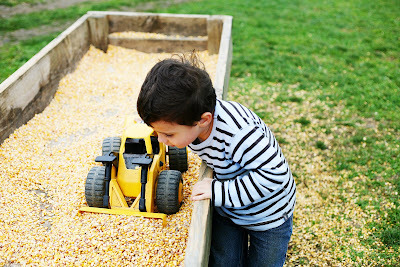 Austin can't wait to teach you all about cars, trucks and most importantly tractors. Mia can't wait to baby you in all of her motherly ways. Daddy can't wait to show you off. I can't wait to sing to you. Tomorrow will be your birthday. A day that will forever hold some of the fondest memories of my life. I will try to sleep tonight because you will certainly be keeping me from getting much of that past tomorrow, but it will be a difficult task because I am overflowing with anticipation. No words can possibly describe the love I feel for you already. I thank God for choosing me to be your Mommy and will certainly do my best to live up to the amazing task of being not only your mommy, but the mommy of 3. My son...my precious third child...see you tomorrow! Has it really been two months since my last post? Ugh! Time flies when you are a full time Mommy and it's Christmas card season in the photography world. 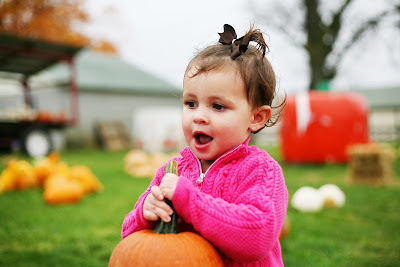 My poor children have definitely become photo deprived since I started this business, but they aren't complaining. My grandma called last week and begged for some pictures...any pictures at all. She checks my blog twice a day. She is committed though I am not. Sorry Grandma! Here are your pictures. I will try to do better! 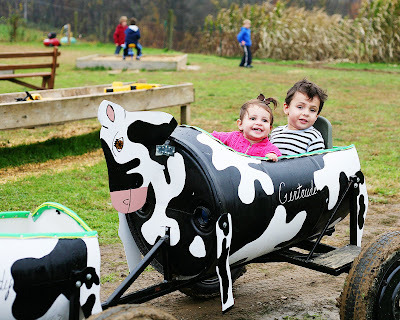 On Halloween we went to a local farm for some Fall fun. Unfortunately it was a cold, misty day, but the kids didn't much care about that. 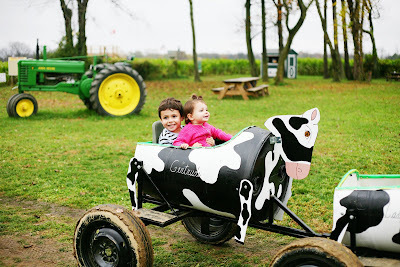 The first thing they wanted to do was ride the bucking cow train. Well, maybe they liked the idea of it when they saw it, but once inside were not so sure. A "train" of four or five cows was pulled by a small tractor and as it moved the cows bucked up and down. Austin loved it immediately. Mia waited a bit for her verdict. But, ultimately she seemed to like the experience. 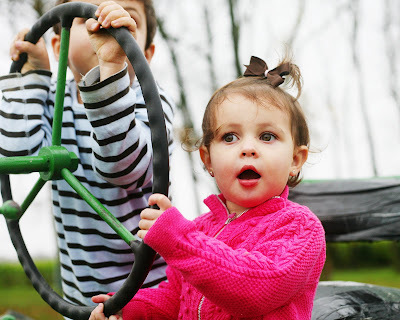 We didn't know how she would do when the train went into the corn field where she couldn't see Mommy and Daddy. We waited for the wails! But, to our surprise, they never came and when they emerged from the field this was her sweet facial expression. Pure joy! Needless to say, they rode it more than once. 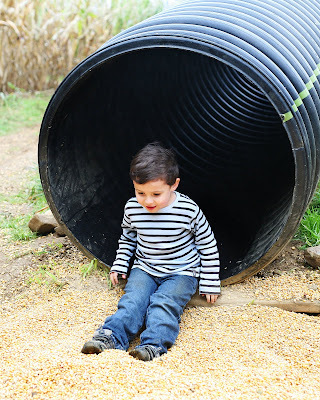 Another highlight was the corn slide. And the "heavy machinery" for corn play. 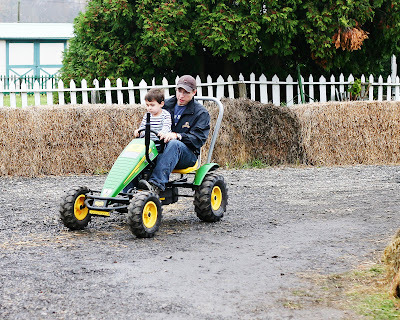 Of course, the John Deere inspired pedal carts were also a lot of fun, though Austin was a little frustrated that he was too short to do it himself. 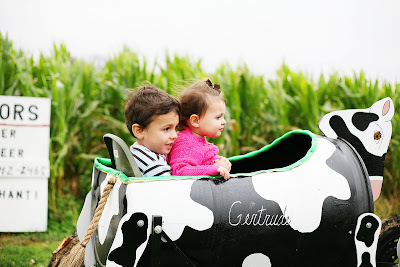 We took a hayride pulled by a tractor out to the pretty much empty pumpkin patch where we weren't even allowed to get off. 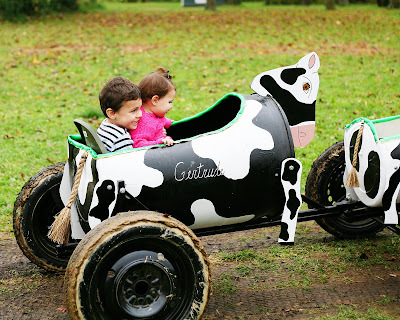 I imagine the pumpkins that were left out there were rotting anyway, but it was a nice ride. 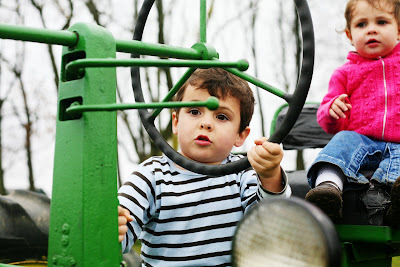 When we got off the kids were thrilled to get to climb on the stationary tractor for some pretend driving. If you ask Austin what he wants to be when he grows up, he always replies with "A Farmer. So I can drive a tractor every day." He was in his own little world up there that day. 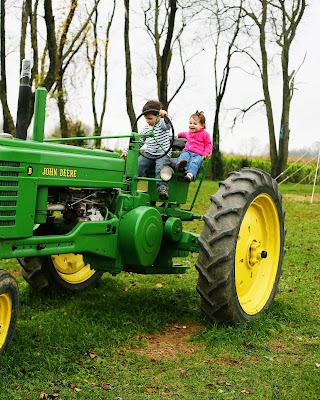 And because Mia has to do everything that Austin does, she drove the tractor too. 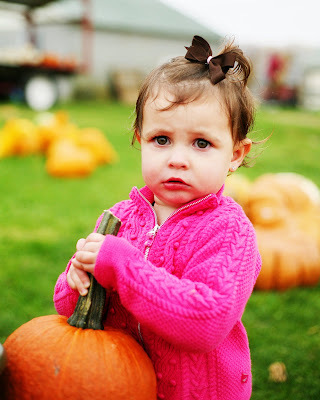 Before we left we let each of the kids pick a pumpkin from the selection they had left. Mia picked the largest one she could manage to carry. Hours later it was time for trick or treating and Buzz was ready to go. He LOVED the $7 costume I got him from a local consignment shop. It really was cool with its light up head gear. He was on a mission and ready to go. After some heckling from his family, Mark decided to dress up as Woody to go along with Austin. Mia who wouldn't be still for a good individual picture, was a fairy. As you can see from the wet steps, it was a rainy night that didn't allow for much candy collecting. But we had a lot of fun and needed to get back home for a very important World Series game. I am still not quite sure how it happened that I turned around and my baby boy became old enough to go to preschool, but alas it has happened. Friday was his first real day. We had gone in on Wednesday to meet his teachers and I think that settled his nerves quite a bit. I still thought he was going to cry though. For the last couple months he has cried a lot when I leave and he knew this was something that he was going to have to do without mommy. He asked me very often, "Are you going to stay with me Mommy?" I feared my weepy reaction if he started to cry. But, you can see from the above photo and the ones to follow, he was ready to go. It was a VERY rainy and cold day. He was excited to get to wear his raincoat. He walked right in, hung up his backpack and coat and started playing. He really didn't even look back. We had to call him over to say goodbye to him. He had a great first day. At least that is my assumption because I got very little out of him when we got home. I do know that they had Cheetos for snack. That may be the only information I am able to get out of him most days. But, as long as he is loving school, I will be a happy momma. Thank you to everyone who entered the giveaway for the Little Pink Turtle. I hope you enjoyed browsing their fantastic merchandise and will consider making them your official bow headquarters. Congratulations Kim!!! You will be receiving an email from the Little Pink Turtle to claim your prize. For those of you who didn't win but would still love some free stuff from Little Pink Turtle, you are in luck because they do Mom's Night Out parties where you can earn free bows and other accessories. Contact them today to set up your party, and help your friends and neighbors out by introducing them to their adorable products. It's a win - win!